If you own or manage a stream bank property, there are many ways to help conserve natural resources! The riparian zone is the land along a waterbody like a river, stream, or pond. 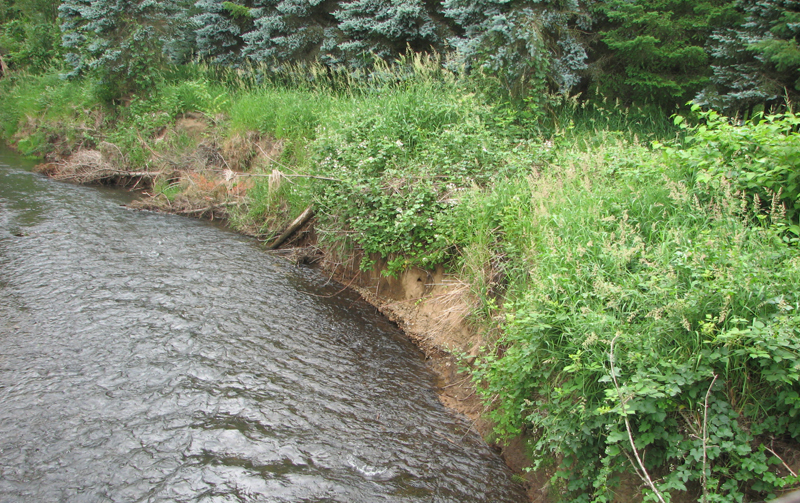 Landowners with riparian areas often contend with problems like bank erosion or invasion of weeds. The District offers technical assistance and several programs that offer solutions to these common problems. Fixing these problems is key to providing health watershed conditions needed for native plants and animals to thrive. 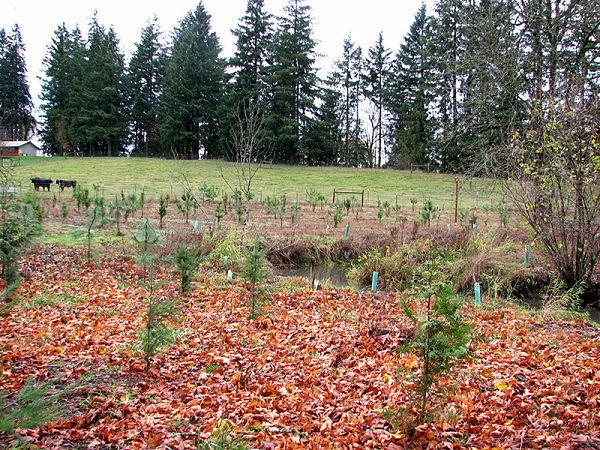 Vegetated banks protect water quality by filtering sediment and pollutants from runoff. Shade from trees and shrubs along the stream helps keep water cool. Streams with trees, shrubs and herbaceous plants are better protected from erosion. Healthy floodplains provide a place for water to go when volumes increase during spring melts and large storm events. Native plants along waterways provide habitat for fish and wildlife. Property values are protected by the natural beauty created by a healthy riparian area! Take a walk along your stream. Is the water shaded? Are your banks bare? Or are you not able to see the stream for all of the blackberry bushes or other weeds taking over the bank? It may seem overwhelming, but we can help you make a plan to remove problem plants, plant native trees, shrubs and herbaceous plants and develop maintenance plans for long term success. The best part? We have funds to help you achieve these goals! The district offers a wide variety of programs for individual landowners with streamside property. The first step in getting started on your stream bank is to schedule a site visit with Jenne Reische. All site visits and technical assistance is free of charge! What stream crosses your property? Do you farm, have livestock or grow trees? What problems are you experiencing on your stream side area? Are you interested in wildlife habitat? When Jenne arrives she will want to walk the stream side area with you and talk about your goals and objectives for your land. She will then tell you how the district can help you achieve those goals. Jenne can do as little as offer tips and information for you to use in your land management or she can develop a conservation plan specific for your property and assist you in finding funding to implement your plan. *Links are for informational purposes only.